Many problems in scientific computing and mathematical modeling can be reduced to solving large systems of linear equations. Since such systems might be very large (having millions of unknowns), they are often solved on supercomputers. Current supercomputing consist of several hundred thousand of processors, and thus their energy consumption skyrocketed. Therefore, it is a very important problem to optimize energy consumption of scientific computations. TOP500 List is a biannually updated list of world's fastest supercomputers, which are measured by the number of FLOPS (floating-point operations per second) in solving a dense system of linear equations using Gaussian elimination. Green500 List tries to solve the problem of energy efficiency by solving the same problem but using a different metric of FLOPS/W. 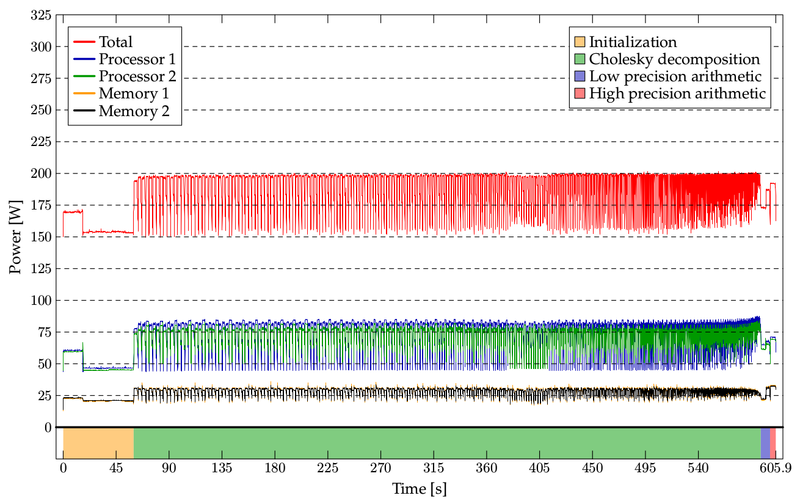 Comparison of different solvers with respect to time-to-solution and energy consumption. Comparison of different solvers with respect to the standard metrics Flops and Flops/W. Power consumption of solving a positive definite linear system of size 70000x70000 using Cholesky decomposition on IBM POWER7. Find an approximative solution to Az=r. Update the solution x := x+z. Recompute the residue r := b - Ax. The number of iterations to solution of a perturbed Cholesky algorithm, for a range of matrix sizes and perturbation exponents. In , we introduce something called an approximative iterative refinement (AIR). It is a modification of IR, solving in step 1 a linear system A'z=r where A' is some approximative matrix. In the standard IR, we may view A' as the low precision approximation of A. Different class of solvers can be obtained when A' contains the key structural elements of A. In , we solved model dense linear systems with decaying structure (with largest values around the diagonal). Then a good approximation A' is the choice of a banded submatrix of A, which leads to finding the solution extremely fast. Also, we have found the surprising connection to the splitting methods. When A = S-T, then Ax=b leads to Sx=Tx+b, or x = S-1Tx+S-1b. The splitting methods iterate the last equation as xn+1 = S-1Txn+S-1b. The surprising connection is that the splitting methods are precisely AIR with A'=S. This allows to give a clear explanation of the splitting methods, which I was using for several years in my advance linear algebra classes. Changing Computing Paradigms Towards Power Efficiency. Philosophical Transactions of the Royal Society A: Mathematical, Physical and Engineering Sciences 372(2018), 2014.